A leading provider of packaging machines was experiencing repeated motor failures with their pick-and-place robots, facing substantial replacement costs on a regular basis. The company chose Maplesoft to develop a high-fidelity parameterized model of the robot. Using MapleSim, the company simulated the robot’s operation and used Maple to understand the exact cause of failure in hopes of finding a cost-effective solution. The results from MapleSim showed the company a solution they were unaware of - instead of replacing motors in every robot, they could modify the robot motion profiles to reduce the moments of greatest motor torque. The company was able to essentially apply a software update to what was previously expected to be costly, on-site hardware replacements for larger motors. Going forward, they are using their MapleSim models for other robots, minimizing the high costs of over-engineered components and unexpected on-site repairs. Industrial automation is on the rise, with machines performing more complicated tasks every day. Designing these complex industrial machines is a challenging process. Engineers need to ensure that the machine they design meets many different performance objectives for productivity, workspace, maneuverability, payload, and so on. At the same time, they also need to develop a design that will minimize both production and maintenance costs, such as using the smallest possible motors and the shortest links for robot arms, and minimizing loading to reduce the wear and tear that leads to expensive repairs and downtime. In light of so many complexities, organizations will over-engineer products, investing in more costly components to reduce unforeseen failures. Others will try to minimize costs, but are more likely to face expensive on-site repairs when unexpected failures occur. System-level modeling offers a third option, providing analysis and deep insight into product performance long before physical prototypes. What is the proper motor sizing for the robot in all operating conditions? What lengths should the links be to achieve the desired workspace? What effect will different combinations of link lengths have on the design? What is the required performance from the motor and gearbox in different use cases? The Maplesoft Engineering Solutions team created a set of analysis tools in Maple to provide the company with deep insight into their design, ensuring that their product is neither over-engineered nor prone to unexpected failure. Taking advantage of the fully parametric MapleSim model and Maple's symbolic computation engine, the tools enable the company to perform simulations across various operating conditions to determine the best combinations of design parameters. The first design tool developed by Maplesoft enabled the company to perform kinematic analysis. The kinematic analysis allowed them to check the robot's workspace, visualize its motion, and determine any required path offsets. The robot motion is affected by whether the robot's elbow is configured to be on the right side or the left side. One of the features of the kinematic analysis tool was to perform the inverse kinematics calculations, and evaluate for both elbow positions. By observing its behavior in both cases, the company was able to make an informed decision about which side to place the elbow – a decision which was then carried forward and applied to all further analyses. While the company naturally wanted to use the smallest motors possible, they also had to ensure that the motors they selected would still meet the robot's performance goals. The Maplesoft Engineering Solutions team developed an analysis tool to assist the company with motor sizing. 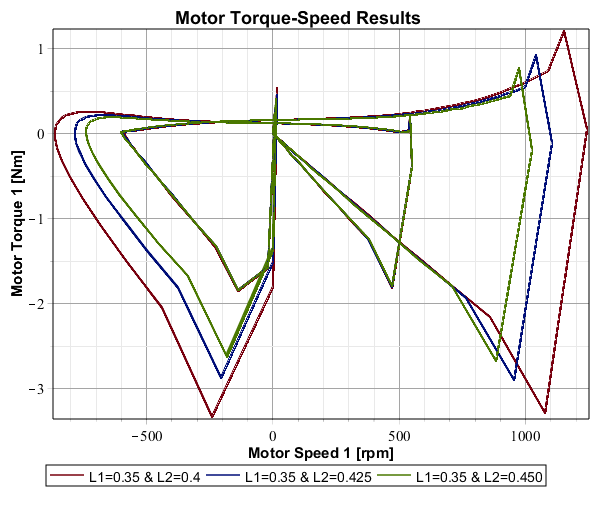 The speed, torque, and energy of the motors were determined and plotted, then overlaid on the manufacturer's performance curves for the targeted motors. The motor performance curves were selected from a list of possible motor data imported into Maple. For each of the motors, the company could then compare simulated results with data for different motors from the manufacturer's specifications. Using the analysis tool, the company was able to consider different motor configurations capable of performing within the desired range. A similar approach of overlaying the manufacturer's data on simulated data was taken to explore the gearbox limits and the selection of different gear ratios. Another analysis tool developed by Maplesoft was a parameter sweep to observe the effects of different link lengths on the operation of the robot. Simulating the model with different link length configurations within a pre-determined permissible range enabled the company to observe the corresponding effects on performance characteristics such as motor speed, torque, load requirements, and workspace variations. Maple automatically makes use of parallel processing, allowing the user's computer to simultaneously run multiple simulations using different parameter values, and then presents the results overlaid in a visualization window for quick and easy comparison. The Maplesoft Engineering Solutions team developed a highly configurable solution that helped the company address challenges and unexpected costs they faced when designing industrial pick-and-place robots. Developing a fully parametric system model in MapleSim provided access to all the system parameters required to analyze and optimize the behavior of the system. Maple's symbolic computation engine enabled the development of a wealth of analysis tools that explored the relationships between system parameters, and their effects on the overall performance. This new approach shed light on solutions the company didn’t know existed, with overall costs just a small fraction of their previous techniques for robot motor repairs. The parametric models are also being modified and used across various pick-and-place robot designs, reducing potential failures and over-engineered parts early in the design process.